Expand your storage with the Vantec MRK-510ST NexStar SE 2.5" to 3.5" SATA Hard Drive/SSD Converter. Equipped with a tool-less removable tray design, the NexStar SE will convert any standard 2.5" SATA hard drive (7mm~15mm) into a 3.5" hard drive with ease. Designed to mimic a 3.5" hard drive; integrate this unit seamlessly into any computer or enclosure and enjoy a pure SATA connection with speeds of up to 3GB/s. Switching and swapping drives easier than ever with the new, truly versatile, NexStar SE 2.5" to 3.5" SATA Hard Drive/SSD Converter. 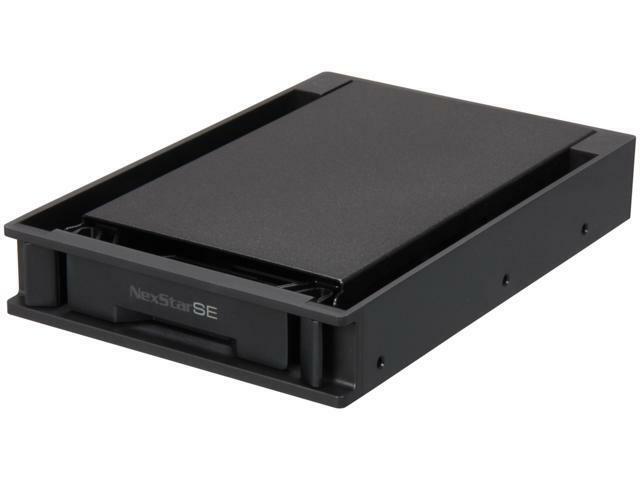 Supports Any Standard 2.5" SATA Hard Drive or SSD (7mm~15mm) The Vantec NexStar SE provides broad compatibility with standard 2.5" SATA Hard Drive or SSD. Metal Housing Metal housing brings excellent heat dissipation as well as tough, reliable hard drive protection. Hot-Pluggable With the hot-pluggable function, it is easy for you to replace your hard drive without shutting down the system. This item is covered by BidDeal Return Policy. Cons: Purchased one of these a year or two ago. Really nice enclosure --- then. The last one I purchased came with these itty-bitty screws to attach my HD rails for installation in my Antec case. Nope! The heads are way too tiny. They are not standard size or thread to fit the pre-drilled self tapping hole in the plastic case. Needless to say, I am very disappointed with my second purchase. I thought this stuff was standard. Other Thoughts: Do NOT recommend you purchase this product if you have an Antec case, or if your rails have larger holes which require sound absorbing washers. Why do manufacturers feel the need to change their designs instead of leaving a good thing alone. Now, I'm looking for a different product. Other Thoughts: got a kingwin that worked with my bay. Pros: When used in conjustion with SYBA SY-MR-35SOF 3.5" Serial ATA hard drive SATA II HDD-ROM mobile rack makes a great way to swap out ssd drives for the computer. Cons: Until this one I would have given it 5 out of 5 stars, but the last one I ordered only works intermittently. Since I have other units, I tested it and the outside carrier is the issue. Unfortunately at $10 to return for rma does not make any sense to return it. Pros: Works perfectly with 2.5" hard drives and SSDs. Clips in securely and has worked great for years, fits nicely in a floppy / media reader drive bay. The packaging was quite excellent. Cons: Some SSDs fit somewhat tightly and can make it difficult to remove the drive from the bay. Not much of a problem really, just need to pull a bit harder. Other Thoughts: Had an SSD with my Operating System running in this bay for a couple of years, has worked well. Cons: none, how could anyone give this product less than 5 eggs rating?